Goals: To improve literacy skills through the assistance of registered therapy teams as literacy partners. We hope to encourage a life-long love of reading and to empower those students who are struggling with reading. Reading to dogs can boost reading skills in children as well as help with emotional and social skills. Programs such as this are gaining in popularity because of these many benefits. Reading to dogs gives children essential extra practice with reading and oral skills. Some children feel that reading becomes less difficult when reading to a dog and are more willing to read aloud at school. Reading to dogs has motivated some children to start reading more at home, especially to their pets. 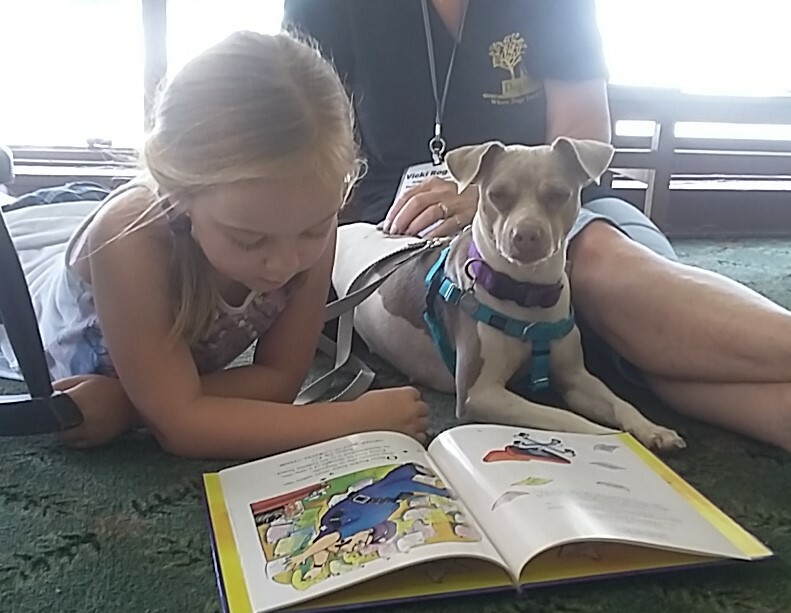 Children want to try reading more difficult books as they go through the reading to dogs program. Kids feel more confident when answering reading related questions. Research studies have shown that reading fluency can increase after participating in a reading to dogs program. Children enjoy the program and think it's fun! They look forward to coming to DogAbility because a dog is waiting for them. Children feel comfortable reading to dogs because dogs don't judge if a word is mispronounced. The process of petting dogs can help with motor skills and is also known to be a calming factor that can reduce stress, blood pressure, and anxiety. Some children feel nervous when reading aloud and reading with a dog immediately calms them down. This activity provides a positive and enjoyable experience that children will associate with reading. Kids feel safe when sitting with a dog from the program. Reading to dogs boosts the confidence levels of struggling readers and gives children an increased sense of pride. A child can feel like a leader by turning the book toward the dog, reading aloud, and pretending he or she is the teacher. Children feel a sense of accomplishment by reading an entire book. If a child has experienced a recent loss of a family member or pet, reading to a dog can help bring them comfort. Children can learn kindness and empathy by petting the dogs, cuddling with them, and bringing them treats. Communication skills can be improved by practicing reading aloud. Time is set aside at the end of each literacy session for general fun and interaction with the animals as well. Email us to schedule a private session. Our weekends and after school hours book up quickly, so please plan ahead.